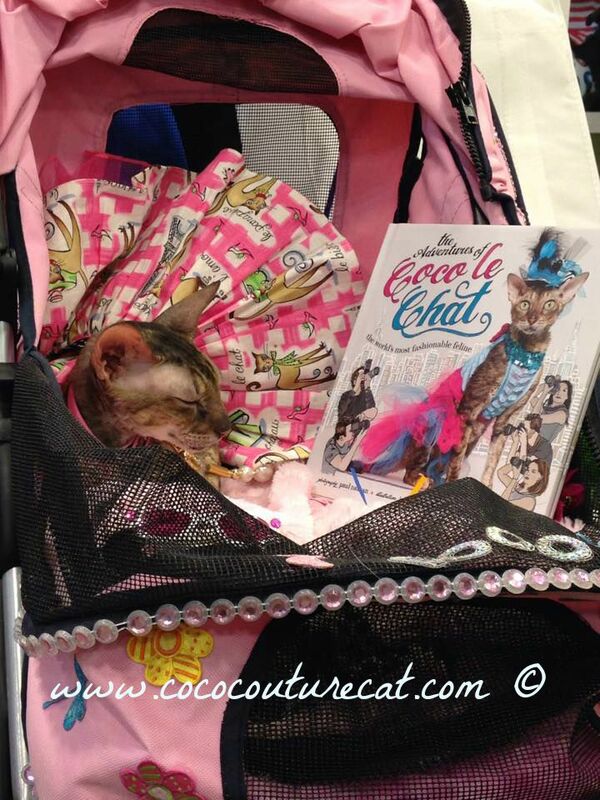 Coco, the Couture Cat: Fashion Friday! 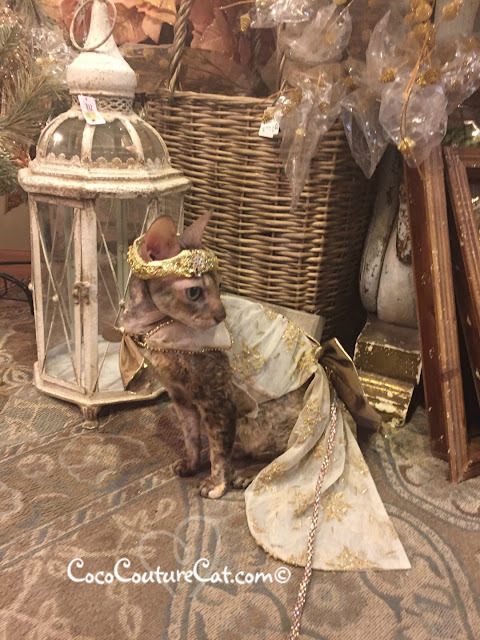 Photo Shoot Success! 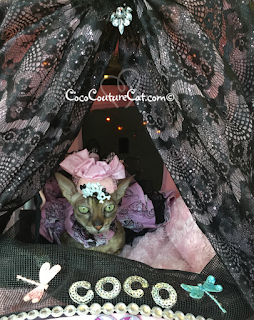 Fashion Friday! Photo Shoot Success! Yes, we know it's been over a month since our last post! Maybe the title of this update should be called Fashionably Late Friday! It might be hard to tell from the photo above, but that is Coco decked out in her Howloween costume, for which she won 'Scariest Costume'.. 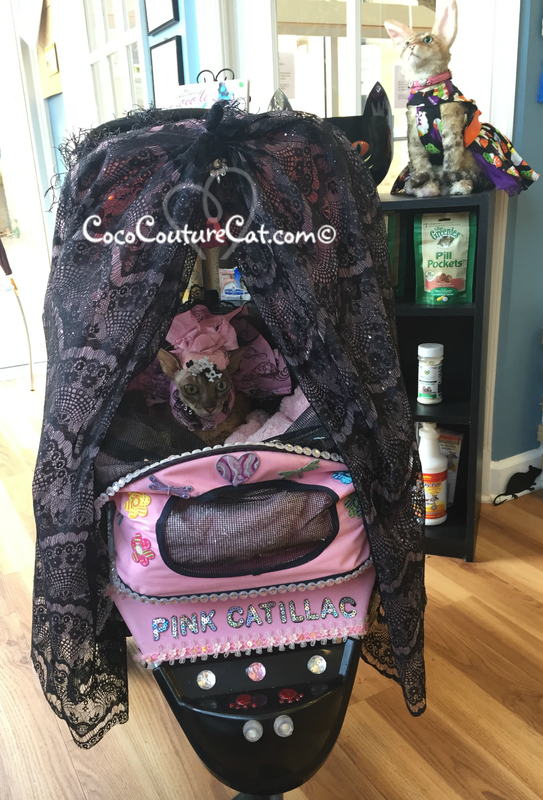 I know it doesn't look frightening at all, since it's girly and pink, but it does have skull & crossbones on it, as does her pillbox hat. I decorated her Pink Catillac, too and think it has a Morticia Addams kind of look to it! This next photo was taken on an outing to historic Occoquan, Virginia and the window display caught my eye and think it makes for a stunning backdrop with a vintage look and she is wearing that Howloween costume contest winning dress, too! Then last weekend, we paid a visit to my favorite Christmas time places to visit, Merrifield Garden Center. Visiting a nursery with a cat? Yes, they are very pet friendly. This year, Coco has some stunning couture to wear and I think the photos turned out well, what do you think? 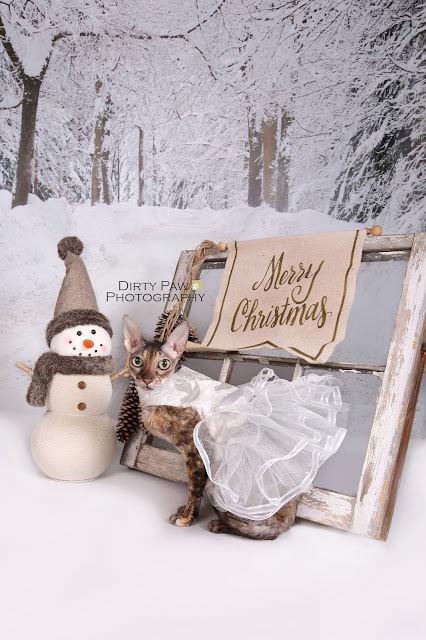 And then to round out a photogenic weekend, Coco and I went to a holiday photo shoot by Sabrina Moore, of Dirty Paw Photography. Sabrina had met Coco before, at one of the Wigglebutt Warriors Gala Fundraisers, HollyWoof. So we were pleased to be able to have a sitting with her this year! 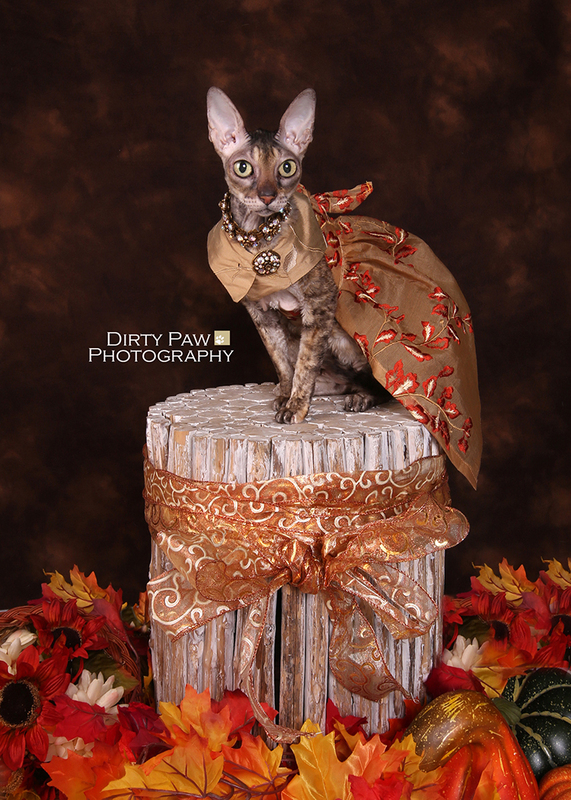 Sabrina does so much to help shelter pets find forever homes, by providing photo sessions free of charge to local rescues and shelters! 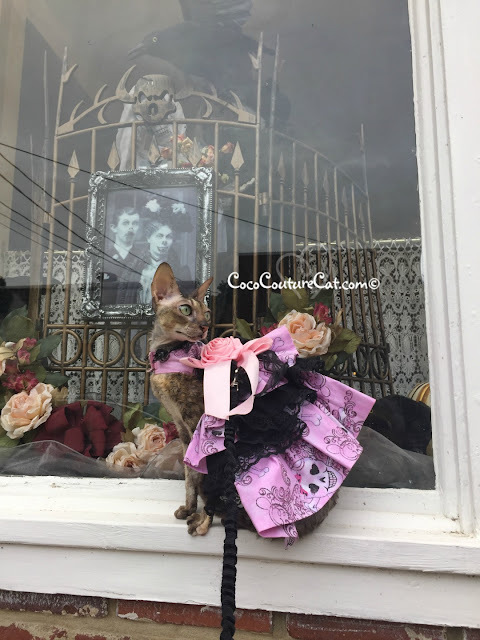 As I didn't have any Thanksgiving holiday/Autumn themed photos of Coco, I decided to dress her in one of the pretty dresses that our friend, Stacy Hurt, made for Coco for the last BlogPaws conference. This next photo was my favorite of those that Sabrina took, with Coco looking so elegant in a dress of vintage fabric! 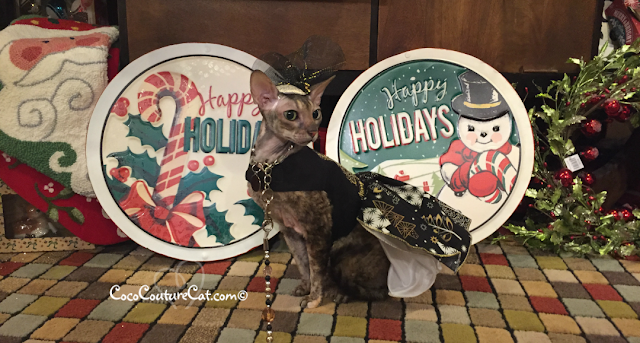 And for fun, we also did a Merry Christmas photo, which would make a nice Christmas card, don't you think? 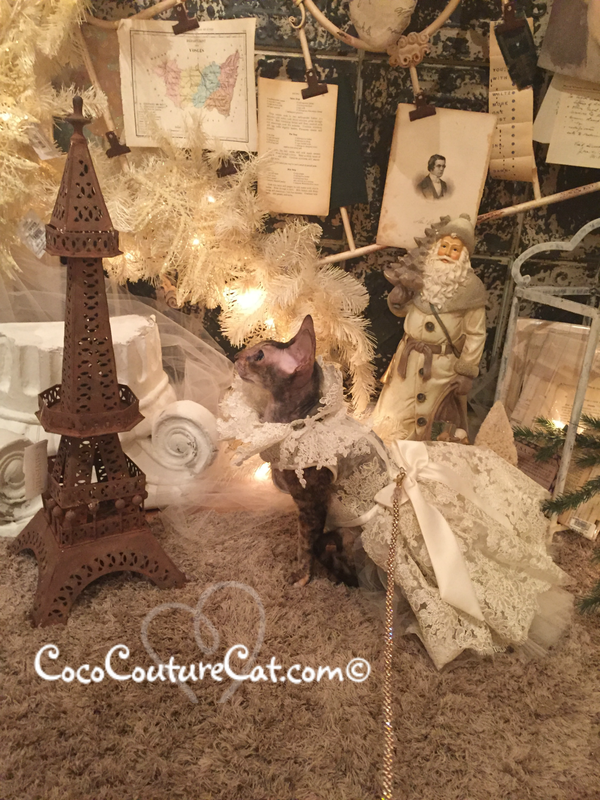 It only looks snowy and cold, with Coco looking sweet in her pretty dress with a beribboned ruffled skirt and silver doves on the bodice. Well, I think that about catches you up on the fashionable fun Coco and I had this past month! 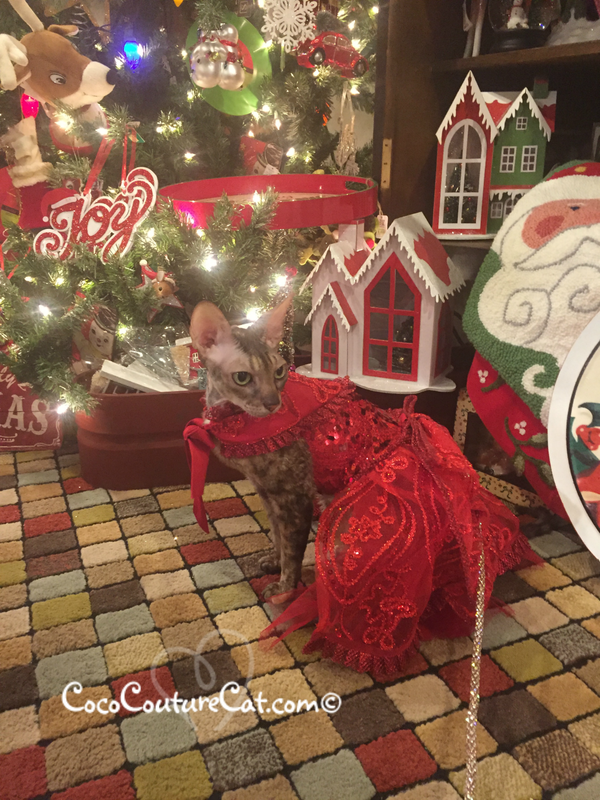 This weekend, Coco and I are off to a cat show in Maryland and the theme is Santa Paws and of course, Coco will be strutting her stuff in some of the holiday finery featured in the photos we shared today. Coco, your holiday outfits are amazing! Hello Coco, furry nice to meet you! You look so beautiful in your gorgeous outfits. 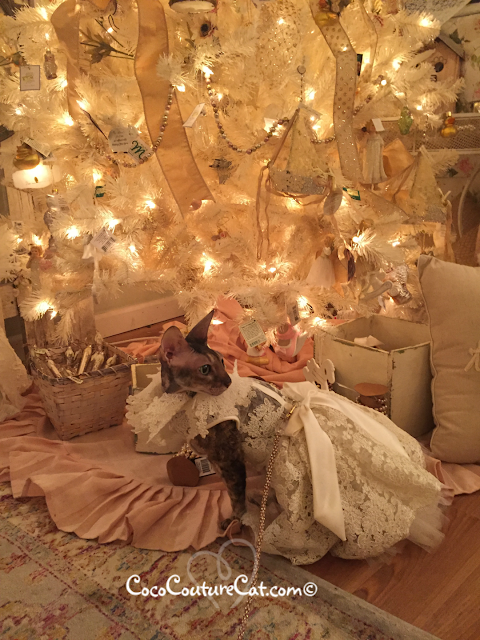 Hope you have a wonderful Christmas and Mew Year. Hope to see you again furry soon. -Katie Kat.